Wide and shallow shape, flat bottom. Used for surface trimming of slopes, dredging of waterways and water ditches. 0 to 3.6 tonne standard bucket with weld on half arrow. 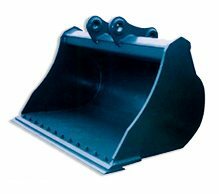 3.7 to 40 tonne can be fitted with a 3 piece bolt on edge for maximum wear at minimum cost.